Many of you will have been to Israel in the past and visited a number of tourist sites such as the Old City in Jerusalem, the Knesset, the beaches along the coast, the standard museums such as the Israel Museum and so on. One of the great advantages of spending your gap year with Aardvark Israel is that we take you to all of these and more. The program incorporates trips to a huge number of locations that the majority of tourists and even many Israelis won’t ever visit and they are all an extremely interesting and enjoyable experience. For instance, one of the things you will learn about is the War of Independence and what was happening before it under the British Mandate. As part of this you will visit the Ayalon Institute located just outside of Rehovot and sometimes referred to as the “underground ammunition museum”. The institute is located 13 feet under a former kibbutz laundry facility. It was created to secretly make bullets for the Hagana military forces in the years leading up to the War of Independence. In order to hide it from the British it was built underneath a “training institute” intended to prepare immigrants for life on a kibbutz. Around 40,000 bullets were produced a day between 1945 and 1948 and be taken on a fascinating tour of the place. You’ll also get to jeep along the Burma Road, this was a secret “road” built by the Jews in 1948, in order to break the siege of Jerusalem during the war of independence. It was little more than a dirt path, but it saved the lives of thousands trapped inside Jerusalem and ensured that the city would be a part of the future State of Israel. Not all of the trips are historical in nature; there are many fascinating modern sites to visit. For instance we will take you on a tour of the Tel Aviv Central Bus station. This may sound dull at first but initial plans for the station were never finished and as a result there are a huge number of fascinating things to see. It is home to an abandoned arcade, six underground cinemas, a nuclear bunker and a tunnel that has so many bats living in it that it has been declared a nature reserve! You will also explore much of ancient Israel. There are special in-depth tours of the Old City of Jerusalem and you will get to visit The Temple Mount, which many tourists will struggle to gain access to, as well as receive guided tours of the various quarters of the Old City. You will also travel to Hebron and Herodian to visit King Herod’s Fortress which was built between 23 and 15 BCE and features some fascinating architecture, stunning mosaics and an underground network of tunnels. Other trips include a “start up” tour of Tel Aviv, a graffiti tour of Tel Aviv, a trip to the Ein Mabua Natural Springs, a visit with Natal (Center to help survivors of terror). Plus, overnight stays in the Galil, Golan,the Negev and Judean Desert, a few days spent on one of the few Kibbutzim still operating as such and manymore unique experiences. All of these trips will give you a better understanding and appreciation of what a varied and dynamic country Israel is and far surpass anything you will be able to achieve on a standard holiday. 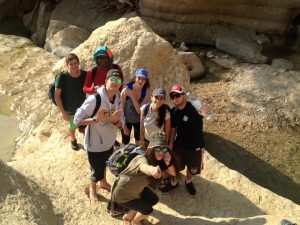 By choosing to spend your gap year with Aardvark Israel you are really giving yourself the chance to see Israel in a wholly unique way.